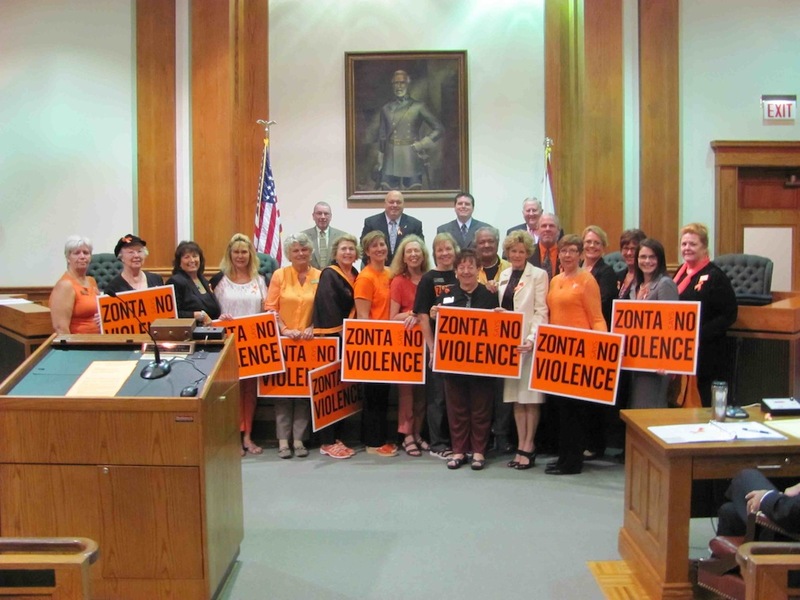 On Tuesday, December 3rd, the Lee County Board of Commissioners issued a proclamation in recognition of Zonta Club of Fort Myers, Zonta Club of Bonita Springs, and Zonta Club of Sanibel-Captiva for their efforts to raise awareness about and support initiatives that work toward preventing violence against women. The proclamation expressed the county’s support of these groups and their mission to mobilize the Lee County community to say “NO” to violence against women. “Zonta Club of Fort Myers is honored to be recognized by Lee County for our work with the ‘Zonta Says NO’ campaign. We appreciate all of the community support we have received in our efforts to raise awareness about this vital issue and bring the community together to end violence against women,” says Martha Nagata of Zonta Club of Fort Myers. “Zonta Says NO” is a global campaign that focuses on the worldwide problem of violence against women. This campaign builds on the Zonta mission to improve the status of women through service and advocacy. On November 25th, Zonta International launched the “16 Days of Activism Against Gender Violence.” This campaign called upon members from 1,200 Zonta clubs in 65 countries to march, demonstrate, educate, and launch other activities to raise awareness about this serious global issue. “One in three women worldwide will experience physical or sexual violence. This is not just a problem that affects women in other countries, but also women right here in Lee County. In November, the Zonta groups of district 11 worked together to raise awareness and incite discussion about this important issue by putting up orange ribbons on power poles and streetlights along US 41. We want to get people talking and taking action to prevent violence against women,” says Nagata. In addition to spreading awareness through their orange ribbon campaign, the Zonta clubs in Lee County have also partnered with agencies such as the Abuse Counseling & Treatment Center (ACT), PACE Center for Girls, SalusCare, and Human Trafficking Awareness Partnerships (HTAP) to help provide grants and offer support to these organizations that offer services to victims of domestic violence and other violent crimes. The Zonta ladies of Lee County at the reading of the Proclamation. The Zonta Club of Fort Myers is a local chapter of Zonta International, a global service organization of executives and professionals working together to advance the status of women worldwide through service and advocacy. Zonta is the only international service organization focused on advancing the political, economic, social and educational status of women worldwide. Zontians work throughout the world to address the needs of women at all socio-economic levels. These needs include basic health, education, welfare and human rights. For more information, visit www.zontafortmyers.org.